Ewing’s sarcoma most commonly occurs in bone and only very rarely in the extradural spinal canal. Herein, we present the clinical course, diagnosis, and treatment of a 6-year-old girl admitted with a complaint of strength loss in her right lower extremity. Magnetic resonance imaging revealed an extradural spinal canal tumor extending from level T2 to T5; she underwent laminectomy. The histopathological, immunohistochemical, and molecular cytogenetic data were compatible with Ewing’s sarcoma. We detected no malignant focus on postoperative staging work-up and prescribed postoperative radiotherapy and chemotherapy. A brief review of the literature on primary extradural extraosseous Ewing’s sarcoma of the spinal canal is presented. Ewing sarkom sıklıkla kemikte gelişir ve ekstradural spinal kanalda oldukça nadirdir. Burada, sağ alt ekstremitede güç kaybı şikâyeti ile başvuran 6 yaşında bir kız çocuğunun klinik seyri, tanı ve tedavisini sunuyoruz. Manyetik rezonans görüntülemesinde T2’den T5’e kadar uzanan ekstradural spinal kanal tümörü mevcuttu. Laminektomi yapıldı. Histopatolojik, immünohistokimyasal ve moleküler sitogenetik incelemeler Ewing sarkom ile uyumluydu. Ameliyat sonrasında yapılan evreleme çalışmalarında herhangi bir malign odak saptanmadı. Postoperatif radyoterapi ve kemoterapi uygulandı. Bu çalışmada, spinal kanalın primer ekstradural ekstraosseöz Ewing sarkom, güncel literatür ışığında kısaca tartışılmıştır. Holland MT, Flouty OE, Close LN, Reddy CG, Howard MA 3rd. A Unique Case of Primary Ewing’s Sarcoma of the Cervical Spine in a 53-Year-Old Male: A Case Report and Review of the Literature. Case Rep Med 2015; 2015: 402313. Kannan KK, Sundarapandian RJ, Surulivel VJ. Unusual Presentation of a Primary Ewing’s Sarcoma of the Spine with Paraplegia: A Case Report. J Clin Diagn Res 2015; 9: RD01-3. Yasuda T, Suzuki K, Kanamori M, Hori T, Huang D, Bridge J A, et al. Extraskeletal Ewing’s sarcoma of the thoracic epidural space: case report and review of the literature. Oncology reports 2011; 26: 711-5. Saeedinia S, Nouri M, Alimohammadi M, Moradi H, Amirjamshidi A. Primary spinal extradural Ewing’s sarcoma (primitive neuroectodermal tumor): Report of a case and meta-analysis of the reported cases in the literature. Surg Neurol Int 2012; 3: 55. Kazancı A, Gurcan O, Gurcay AG, Senturk S, Yıldırım AE, Kılıcaslan A, et al. Primary ewing sarcoma in spinal epidural space: report of three cases and review of the literature. 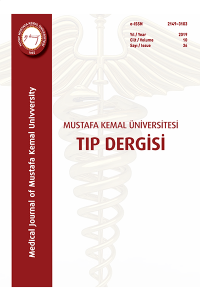 Journal of Neurological Sciences (Turkish) 2015; 32: 250-61. Tsutsumi S, Yasumoto Y, Manabe A, Ogino I, Arai H, Ito M. Magnetic resonance imaging appearance of primary spinal extradural Ewing’s sarcoma: case report and literature review. Clin Neuroradiol 2013; 23: 81-5. Sarı Neriman; Cetındag Mehmet F; Ilhan Inci E. Treatment of Extraosseous Ewing Sarcoma in Children: Single Center Experience. UHOD 2009; 19: 147-52. Zhu Q, Zhang J, Xiao J. Primary dumbbell-shaped Ewing’s sarcoma of the cervical vertebra in adults: Four case reports and literature review. Oncol Lett 2012; 3: 721-5. Giner J, Isla A, Cubedo R, Tejerina E. Primary Epidural Lumbar Ewing Sarcoma: Case Report and Review of the Literature. Spine (Phila Pa 1976) 2016; 41: E375-8.